Capitalists@Work: Are the markets broken or is this an opportunity - Ryanair? Are the markets broken or is this an opportunity - Ryanair? I never fly Ryanair, after many years ago they cancelled a flight on me the day before we were due to go, costing me a fortune to have to re-book the day before flying....an experience now being felt by a very wide number of people indeed. So, it is a company I have always viewed as a parasite, but one which at least is a good capitalist business in that it appeals to a market keen on low prices above any service levels. And what a market it has cornered, long now the largest European airline by passenger numbers and value. But this last two weeks, its mis-steps have caught up with it, a big mistake with holidays is being exploited by its pilots and now it is cancelling tens of thousands of flights for months in advance. However if you look at the shareprice...not much has changed, it pretty much follows the pattern of its rivals with a maybe 8% dip overall this month. Today the price has started recovering a bit. The shareprice is still substantially above where it was at the start of the year. I see this as an opportunity, investors are relaxed at its bullet-proof business model - but surely the intangible brand damage is huge. Where possible, people will think twice in the future about flying with Ryanair, I know I did! Also today the CAA has gotten involved, belatedly, as the PR mess gets out of control. Loads of people fly Ryanair despite loathing them with a passion. Not sure if their brand is possible to damage. Funny you should say this. It's payday this morning and I've just been eyeing up shorting it myself. I'm amazed the price hasn't moved more, earnings growth was slowing anyway and a p/e of 16 is fairly high for an airline. Reminds me of Deepwater Horizon, you could see the oil flooding out into the sea live on 24 hour Sky News. But the brokers were all yelling 'buy' after the share price had fallen 10% and talking upt he long term prospects. I can't decide whether to pairs trade it with Easyjet though. Done - sold @ £1/point @ 1667, stop loss at 1801. If this works I'm going to treat myself to a bottle of that new 24 year old An Cnoc for Xmas. Supposed to be an absolute steal for £120. I see Dart Group is on the up today too and has broken out of it's 50 day moving average. Tempted to buy some for my SIPP, never had a bad experience with Jet2. SL - not tempted to pair as will get tarred with the same brush, on the chart above IAG moved a little higher perhaps? A p/e of 12 based on 2017 earnings is about 1260p. - like a big rise in the oil price that cannot be passed on to flyers. Flew ryanair yesterday and it was only an hour late, so I felt privileged. I think it's a miracle that we can fly anywhere, let alone so cheaply. regardless. You should be able to rely on the service you've paid for. You cannot pay for an expensive holiday and then take a chance on the airline. A disrespector of staff and customers. Michael O'leary. Could he be wrong on Brexit too ? I've flown with Ryanair loads of times - in fact I'm quite the fanboy. I can put up with a couple of hours of discomfort (and it's really not as bad as everyone makes out) if I can get halfway across the continent for twenty quid. 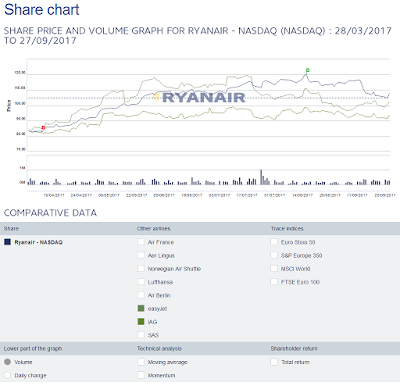 However... and this is why I think this will be far worse for Ryanair than the market suggests... I would not book with them now. It's simply not worth the risk. £50 (or whatever) extra for a flight with a different airline in order to avoid cancelling a weekend trip, or losing a day from a week away? I'll pay that. I've also recently discovered joined-up train fares, where your continental ticket includes the Eurostar. I paid £70 for a return to Milan last year, by train. Being in London already, door to door was only a couple of hours longer than flying after taking into account getting to the airport, hanging around, getting a transfer the other side etc; the experience was far nicer and I was able to bring back a few bottles of wine. Shuffling through an airport nowadays is a miserable chore. Charlie - where do you find fares like those? I'd love to do Europe by train rather than plane - happy memories of sleepers to Munich/Innsbruck back in the 60s. Ryanair is going to struggle to shake off this loss of trust in the long term. Would you rely on it for your expensive all inclusive trip ? They're screwed Kev, screwed, only a nutter would hold this stock. They'll probably get nicked for misleading consumers and fined millions too. And I'm a bottle of Lagavulin up already. Boeing could 'turn off' Britain's attack helicopters if the UK takes revenge for punitive US tariffs on Bombardier that threaten thousands of jobs, it was claimed today. I'm more worried that China could turn off our internet tbh. As a wee lad playing with electronics, most of the transistors came from Burnley. What indigenous chip fabrication have we left? Anything? a/c/t wiki we have 6 plants in UK. Singapore has 14, even Malaysia has 9. Israel/Ireland have 4 each. Germany has 12. If Ryanair cost cut any more we could be talking about a different kind of crash. Anon - I recently started electronics as a hobby. The stuff I'm learning is well out of date but I know enough to appreciate the innards of some old UK amps I have taken appart. Damn - we were good ! Absolutely Kev, you'd have to be bonkers to get on a £9.99 flight with no pilot. I'm not even convinced that ditching the pilots is a big enough cost saving to be charging £9.99 a pop. Dooooomed I tell you. If anyone wants some actual free money. Paddy Power are offering 8/11 Ben Stokes won't play in the first Ashes test in November. If anyone hasn't a clue what I'm on about have a look on youtube for 'ben stokes sun video'. There's no way they can't sack him for that.